If we were to get inside Emilie Stark-Menneg’s head, we might find a tangle of adventure stories and rainbows, kitty cats and fiery rituals, a bright world prone to dissolving as fast as cotton candy. The paintings in Stark-Menneg’s show at kijidome render that world like a sugar high, in Day-Glo colors and outlines that fuzz, seep, and crackle. 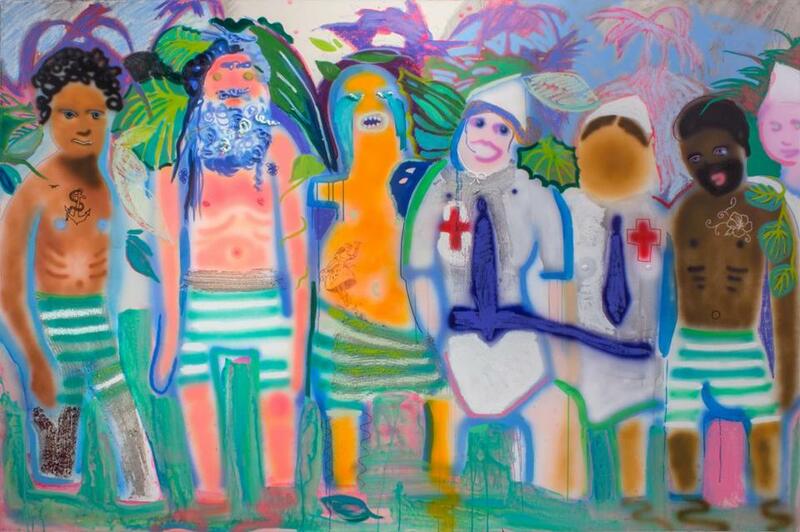 “The Potlatch” depicts two nurses amid a line of skinny men in striped swim trunks. It’s a steamy scene; lush foliage behind the figures hints at the tropics. Stark-Menneg airbrushes the figures so that they’re almost vaporous, but their sun-struck tones give them the whiskey-potency of a desert mirage. Her intentionally childlike style makes them cartoonish, some with clear features, others with blank, distorted, or exaggerated faces. Sticklike legs poke toward a melting, dripping ground. Tattoos look drawn on with a Sharpie. Her technique is strong: The paint rivets the eye with pattern, crisp lines, and texture, and then sets it in a daydream drift with airbrushing and dropped details. Her images can be too romantic. Narratives rife with derring-do appear again and again. “Over the Falls,” the one sculpture here, is a gaudily ornamented mannequin, arms raised in plunging position. “The Potlatch” springs from family lore. Stark-Menneg’s grandfather was a merchant mariner whose ship was torpedoed by Germans in World War II. He and a few shipmates survived 32 days at sea before rescue came. Instead of being a dark tale, Stark-Menneg gives it a goofy, gauzy spin. But a thread of threat adds a satisfying bass note to her high-pitched style in “House Arrest.” A man waves a shirt painted with a Palestinian flag over a fire, and a giant-headed cat nurses kittens. A pink-haired woman wields a camera like a magic flask. The scramble of bizarre details, clever uses of paint, and a crafty use of space push the artist’s candy-brightness toward mania and flush the piece with ominous beauty.